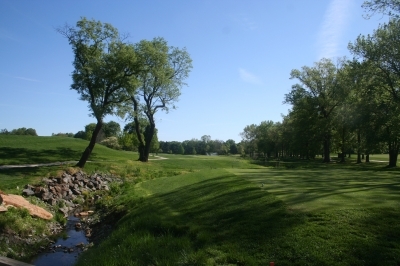 WILMINGTON, DE � �Fore!� A term we�re used to hearing in golf, an accepted custom of shouting towards players (or anyone else) who might possibly be in the estimated drop-zone of your golf ball. Looking towards the 2nd green. When you see the size of the bunkers on the DuPont Course, you'll know that Alfred Tull's influence is back. Henceforth, watch them dart for cover. Most of the time you use the term, it�s an �unintentional� situation � but in this day and age of golf balls that fly longer and hot-faced drivers that are scientifically engineered to propel it much farther than in the past, you�ll end up yelling �Fore!� more often than you�d like. 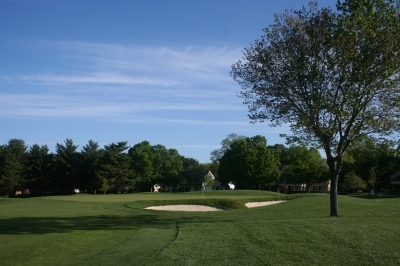 It�s especially true at many old-style golf courses, such as the DuPont (Championship) Course in Wilmington, Delaware. Or, should I say, it was the case at DuPont, before its Lester George inspired renovation. You'd never know it now, but the par four 12th hole used to be rather tight. Lester George took out some trees and re-shaped the green to look more like the original. �Forget the fact that it�s not how it was meant to be� it�s a safety hazard too!� George exclaimed. The par five 9th hole isn't that long (548 yards) and is pretty wide -- certainly inviting you to hit a fairway wood towards the green on your 2nd shot. 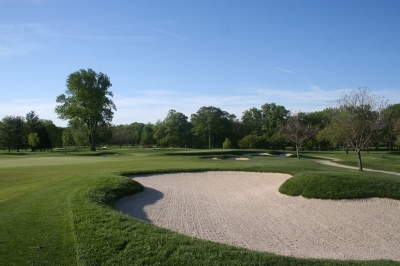 The DuPont Course was hardly �obsolete,� having recently hosted a LPGA major championship on its well-kept fairways for eighteen straight years (2004 was the last time). But because it�s a classic, �core� golf course with holes lying adjacent to each other, some of the greens and tees were getting a little too close for comfort. The DuPont Company has always stressed employee safety in its business dealings, and it didn�t want its top golf course to tarnish that reputation with some dimple-dented members, either. The 15th hole is brand new at DuPont. By all accounts, the new hole is much more interesting -- and demanding -- than the one it replaced. �Plus, the course hadn�t had any new sand on it in fifteen or so years, and was just starting to get depleted � it wasn�t really the championship golf course that everybody thought it was. So we master-planned some changes, and DuPont liked what they saw. We�d just put back some of the original strategy in the design, and introduce the modifications to bring it up to where it needed to be,� George added. Not all of the bunkers are big and deep after the renovation -- but a lot of them are, whether in the fairway or near the green. Here, cutting the corner on the par four 6th hole. 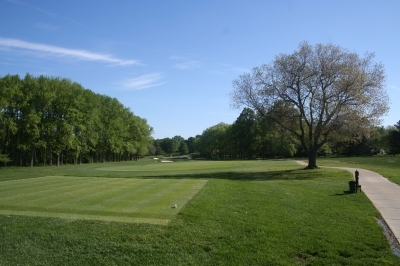 DuPont�s transformation began at the opening hole, where the first green was moved farther to one side for safety reasons. George said he moved the fifth green for historical reasons (closer to where the original had been), and the fifteenth hole is a completely new golf hole � moving the green across the creek, building it up, then pushing the 16th hole�s tees further up the hill. That made the par five sixteenth�s tee shot easier, too, because it alleviated the need to play a snap-cut off the tee. Based on his work at places like The Greenbrier and the Country Club of Virginia, George has acquired a name for his meticulous restoration work. But the DuPont project was a renovation all the way. 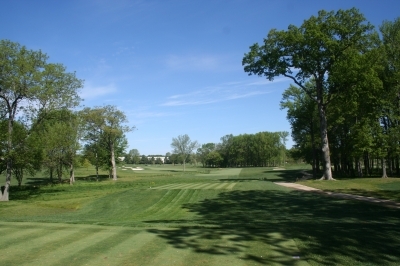 The DuPont Course is kept in such great shape that you never have to wonder what's fairway, first-cut or rough. Here, the green of the par four 7th hole. As part of the evolution of the 15th hole, the par five 16th hole's tees were moved back -- and now provides more choice on what type of shot to hit. Facts don�t lie, and George�s work made the course significantly different, and significantly better. Matlaga said they added nineteen bunkers, enlarged the greens by 22%, the fairways by 30% and the tees by 50%. And although trees were taken out throughout the course to improve playability and circulation, 112 more were planted to enhance the course. Conditions also vastly improved, thanks in part to 48 acres of sod being installed for the tees and roughs. The grass surfaces were completely changed from bentgrass/poa annua fairways to just bentgrass. 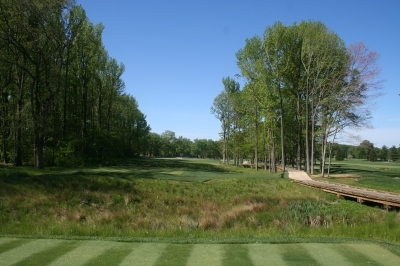 The rough is a bluegrass/fescue mix called �By George� that was developed especially for George�s design at Kinloch Golf Club in Richmond, Virginia. Finally, the greens are now an A1/A4 bentgrass that is very durable and heat tolerant at the same time. While the entire facility was in excellent condition, special note goes to the greens. They were as good as any we�ve seen � anywhere. 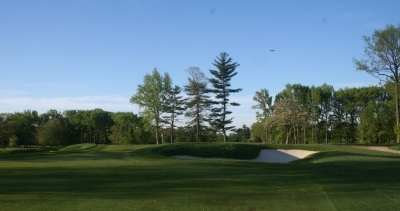 George credits the Superintendent staff � led by Tristan Engle and Scott Kroll (he also said the former Superintendent, John Gosselin, was instrumental in the renovation work). I had the chance to meet them both, and they humbly admitted there�s still much to do. Perfection, when it comes to maintaining a property, is very hard to achieve. But give some of the fringe areas a chance to grow-in a bit more and there won�t be any cause for complaints. Superintendents never get enough credit for the work they do, or the hours they put in. Here's to all Superintendents everywhere. Pictured, DuPont's Tristan Engle and Scott Kroll. 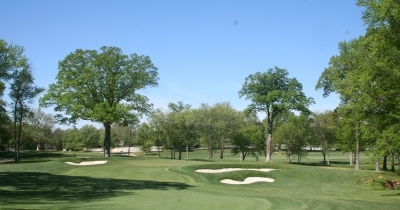 Playing the DuPont Course is an absolute joy � that is, if you like very walk-able old-style courses with enough forgiveness where you won�t lose many balls and enough challenge that subtle changes in pin positions will make every hole play different each day. Overall, the layout is very well bunkered in the tee shot landing areas and nearer the greens. The par threes call for different clubs � �anywhere from a seven-iron to a three-wood, depending on the wind conditions. There�s also a good mix of par five yardages, providing risk-reward options for your second shots,� according to Matlaga. As is true on most holes, you can try and run it up to the par three 17th hole -- but if you want to get close to the pin, you'll need to challenge the bunkers. The only disappointing aspect about DuPont (for the public, at least) is that it�s a private club � mostly. The club (and its three golf courses) is owned by the corporation of the same name, for the benefit of its employees and retirees. 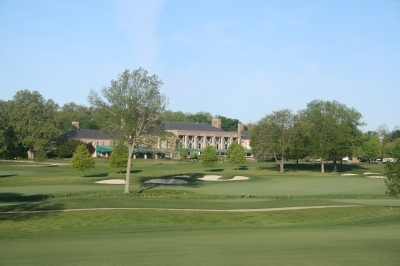 The DuPont Club currently has 9,000 members, with 2,500 golfing memberships. 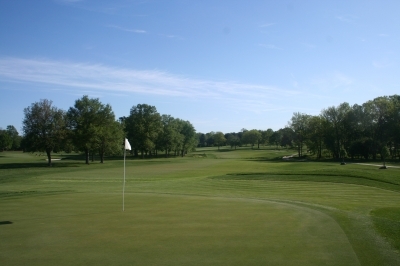 In addition to the golf courses, the club offers lawn bowling, two banquet facilities, six indoor and nineteen outdoor Har tru tennis courts and an extensive fitness center. The club will grant limited golf access to guests staying at the company�s DuPont Hotel, however, and also hosts a number of charitable events by outside groups on Mondays. In other words, it�s not impossible to get a chance to play there, and well worth the effort if you get an opportunity. I toured the course with a DuPont member, Pete Rigby, who was more than happy to point out the numerous ways in which the layout was improved � even from its former days as a LPGA major championship venue. He said the members couldn�t be more pleased with the work that was done � save for one hole, the par four second, which features a raised green, huge bunkers in front and a sloped green that�s very difficult to hold for anyone who can�t stop their ball on a dime. DuPont's clubhouse opened in 1949, and still shines bright even today. You can see it from several holes, such as here, on the 3rd hole. �Now, if you choose to drive it in the 9th fairway, there�s no way you can hold your approach shot into the second green,� George said, very obviously satisfied. The 18th hole offers a split-fairway option. Risk the more narrow left-side and it's a much easier shot to the green... but there's a lot more room on the right. They may not realize it, but the people playing the ninth hole � and the entire course � are much better off in the post-renovation days. Safer, you might say. The �new� DuPont Course will be that much more enjoyable, that much more playable, and that much quieter, even, taking away those dreaded shouts of �Fore!� that no one really wants to hear. Note: Our thanks to Pete Rigby for his patience and sense of humor during our visit. Membership to the DuPont Club is restricted to DuPont employees and retirees. Limited play is offered to guests at the DuPont Hotel, and to groups holding outings.